We went over to Grandma Ber's and Grandpa Fuddy's house for a tea party. The boys had a lot of fun and the food was great. Grandma Ber told Hudson a few weeks ago that he needed to come over for a tea party. He replied, " we don't drink tea"! I was so glad to hear him say that because we have been trying to teach him that Heavenly Father asks us not to drink tea. He has been offered in Puerto Rico so it was good to hear that he remembered that. Remy mostly just climbed up and down and had a bite to eat here and there. My little brother Parley left on his mission to Brazil last Tuesday. He flew straight to the MTC in Brazil! He is such an amazing example to me, he is the most kind person I know! He will to awesome! Love you Parley ! This is a picture of my siblings, and spouses ! I love them and miss spending time with them! The love of my life left on Tuesday to go back and work! I miss him so much! I am ready to go home and be a little family again. Moving to PR has made us a stronger couple and family. Don't get me wrong we love visiting with our family and miss them, but I have learned to rely on Travis and work on making our little family stronger! I love you Travis! Remy and my cousins little boy Graham! They enjoyed the swing together for a while! It was fun to see them they are living in Hong Kong and came to visit their family for a while. Hudson and Remy miss their Dad too! Travis is such a good dad! I am so grateful for him and all the help he is to me with the boys! Happy late Fathers Day ! Congrats Hollie and Joe! We were able to go to Arizona for Travis's sister's wedding. It was awesome and little Adie was sealed to them and it was such a awesome experience. We stayed in Arizona for about a week and were able to visit a lot of Trav's family and had some good visits. I forgot to take some pictures at the reception so I took one of me and Trav looking a little tired. It was so fun having all the grand kids together. They have such a good time playing together! I wish we could do it more! We were able to spend some time with Travis aunts Sandy and Marilyn. We have been lucky to meet up with them a few times in the past few years and they are so much fun! Aunt Sandy surprised us all at the reception, she told us all she wouldn't be able to come. We went to Travis Grandparents grave, it was a really nice gravestone. Travis only has one Grandma who is still alive and the only one I have been able to meet. It will be so nice to meet them all someday. We saw this Train on the side of the road and had to stop so the boy's could climb on it. Remy loved this puppy, he would give it a big hug then let go then want to hug him again. We went to Aunt Vicky Lynns house to visit and they let the boys ride the horse and took them on four wheeler rides. This is Remy's third attempt riding a horse, he loves the horses from a distance, when you try to put him on he freaks out. Hudson getting ready for a ride. They have these awesome bright flowers in Arizona and I had Travis stop and take a picture on the way back to the airport. It has been cold the past week and it is killing me! It rained hard today and hailed ! Hudson went out after it stopped hailing to eat the ice. It was so weird to go out and feel cold rain! Hudson came in soaking wet and freezing! Grandpa Lindz layed Remy's blanket out this morning and layed on it. As soon as he saw Grandpa he had to join! Hudson helping uncle Brady mow the lawns. Remy eating his toes ! I didn't know that eating toes would make someone have so much joy! 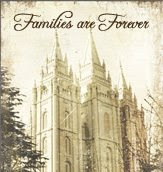 I went with my family up to Canada to go to the temple with Alley, my brother Brady's fiance. They will be getting married on June 19th, Alley is from Canada so they also had a open house that same day. I left my boy's with Grandma Ginger because we were traveling 13 hours there on Friday and then 13 hours back on Sunday I didn't think they would enjoy that ride. It was a lot of fun and and I am so glad that I was able to go. We all missed Travis and I can't wait to see him in a few days! Here we are at the border, Grandma Ber and Grandpa Fuddy also rode with us it was fun to have them with us! Alley and Brady, Alley asked me to do her hair for her, her friend Lindi came up with the style, I had a lot of fun doing it. The girls, Bethany my little sister who is now taller than me, Grandma Ber and my Mom. Bethany and I at the Cardston Temple, it is such a beautiful temple in and out! Cardston Temple, this picture I took at 10:00 at night it doesn't get dark their until 11:00 at night. We went up to my sister in law Norine's house a few weeks ago and went to the park. They have a fun park were you can feed the ducks and geese. The kids all loved it and had a lot of fun. The kids, Remy, Paisley, McCoy, and Hudson. It was fun to have the cousins together and we sure missed Adie. Paisley, she is the cutest girl ever! Always smiling and so chubby! We love you ! My friend Riva and I took our kids to the Dinosaur museum and farm at Thanksgiving point. We had a lot of fun! Hudson loved the pony ride! Remy wanted nothing to do with it. He loved the horses from a far. see his concerned look in the picture. Remy and Viola were troopers, they were nice to let the big kids have some fun. Hudson and Olivia, they are good little buddies and pick up right were they left every time we get to visit.